Boston — In 2017, U.S. industry spent $10.2 billion on water management, including water acquisition, treatment, reuse, and discharge. Bluefield Research’s new report, Opportunities in U.S. Industrial Water: Market Size, Trends, and Forecast, 2018-2022, analyzes water management spend across 20 water-intensive industries that cover oil & gas, chemicals, power, food and beverage, and light & heavy manufacturing. Overall, water use in the United States is estimated at 322 billion gallons per day, with manufacturing, mining, oil and gas, and power accounting for 47 percent of total withdrawals. According to Bluefield’s analysis, industrial sector withdrawals have steadily declined 30 percent over the last three decades. 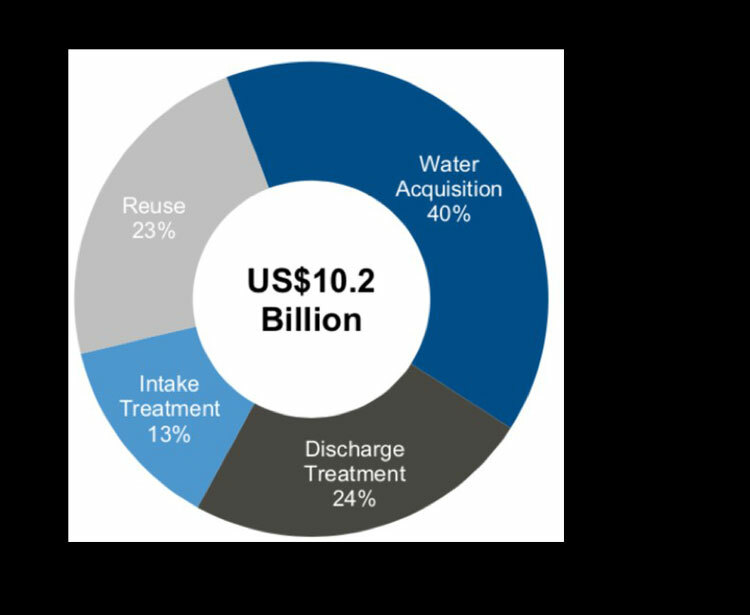 For water solutions providers, industrial demand for improved water management presents significant opportunities, particularly as companies’ attention to water costs and operational risks increase. Facing a changing regulatory environment, emerging climate risks, and a need for access to reliable water supplies, companies are deploying new technologies and strategies to better address their water footprints. Water demands vary significantly across a highly fragmented industrial sector in terms of treatment needs, effluent strength, water intensity, geographic consolidation, and segment growth, according to Bluefield’s report. Food manufacturing, which makes up 10 percent of the annual total, is highly fragmented across U.S. states and requires more commoditized solutions, such as filters and mobile treatment systems. At the same time, a more mature, slower moving downstream oil segment that is limited to approximately 140 refineries in a limited number of states, call for heavily customized treatment systems capable of handling hundreds of thousands of gallons of effluent per day. Bluefield’s analysis identifies wastewater reuse as a key focus of change. To make greater strides in this area and improved efficiencies, decentralized treatment systems, digital monitoring, and alternative water sources are expected to grow in adoption. While federal EPA and state regulations pose longer-term drivers, the pace of regulatory change is having less of an impact than bottom-line driven solutions. Opportunities in U.S. Industrial Water: Market Size, Trends, and Forecast, 2018-2022: Bluefield Research analyzed the industrial water market across 20 industries, 3000+ counties and four water management categories, covering an industrial landscape of over 300,000 facilities. Learn more at https://www.bluefieldresearch.com/research/opportunities-industrial-water.